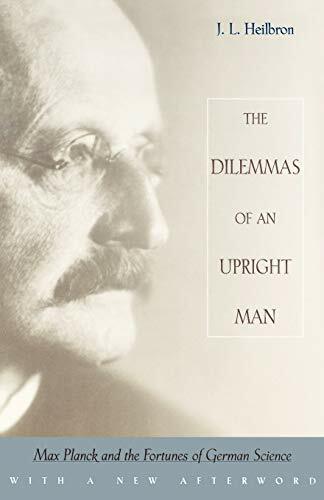 Max Planck, certainly one of the fathers of modern physics, and arguably the dean of theoretical physics in Germany at the turn of the 20th century, was a famously decent man whose association was prized for both his physical insight and his seemingly apolitical rectitude. In this short volume, famed historian (and Vice Chancellor at U.C. Berkeley) J. L. Heilbron offers an exhaustively well-documented biography of the iconic physicist, building up Planck's personal history from birth in 1858 to elucidate his struggles to avoid a Faustian bargain with the Nazis. Heilbron’s effort is all the more impressive in light of the fact that all of Planck’s personal papers were destroyed during Allied bombing in 1944. What is the standard of decency in an environment of consummate evil? Planck acquiesced to the gradual replacement by Nazi sycophants of Jewish scientists and managers in the various technical institutes; in suborning the quiet departures of the latter, was he de facto supporting an anti-Semitism that he did not share, or was he ensuring the continuity of scientific research and helpfully lowering the visibility of those Jews? And in working so hard to allow that research to continue, did his larger goal of theoretical understanding justify the moral imperative to avoid abetting Nazi weapons research? It is an impossible judgment, and thus one that Heilbron avoids making. If it was so important to Planck to pursue a physical model of an objective universe, could he not have made the same choice as Einstein and many others, continuing his research abroad, and divorced from the corruption that Germany had embraced? Only in principal, for despite Planck’s evident morality toward others, it is difficult to underestimate the importance that he attached, not just to science in general, but to German science in particular. Planck had a very nationalist upbringing, and both he and his family were ardent supporters of the Kaiser's cause in the Great War. The survival of German science as an institution—producing valuable research, respected on the world stage—was paramount to him. And so it came to pass that some manner of Faustian bargain could not in the end be avoided. Early on, Planck interceded directly with Hitler on behalf of his institution, naively accepting the latter's assurances that no harm would come to the Jews, in order to ensure its survival. And when in the end the promises were broken, and any semblance of institutional integrity became untenable, he founded what eventually became the Max-Planck-Institutes, a virtual ark of intellect in the physical sciences, scrounged with the best staff and what little funds he could manage. In a significant sense, he succeeded; his own rectitude and determination became the lever with which German science and scientists were eventually rehabilitated by the world. But his own worldview betrayed him, for the price that he paid for this rehabilitation was a larger moral ambiguity that will haunt his memory forever. Heilbron does a characteristically excellent job of elucidating Max Planck’s politics, philosophy, and even the quantum physics he developed, all in service of his exploration of these issues. This is a valuable book for anyone wishing to understand the maelstrom within which the greatest scientific paradigm of the 20th century was shaped.